Requirements were revised since the previous edition - (34299B - 2006 Revision). Click here to see the previous requirements. and part of requirement 3 for the Sportsman Activity Badge. Give a short report to your den or family on the dangers of drugs and alcohol. Practice finding your pulse and counting your heartbeats per minute. Determine your target heart rate. 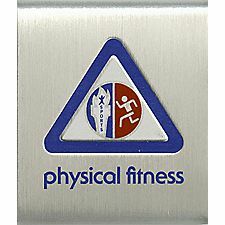 Practice five physical fitness skills regularly. Improve performance in each skill over a month. Skills could include pull-ups, curl-ups, the standing long jump, the 50-yard dash, and the softball throw. Choose a form of exercise, bring your heart rate up to target, and keep it there for 15 minutes. Don't forget to warm up and cool down. Swim for a total of an hour, charting your time as you go.